I cannot remember a time when I didn’t dance. As a small child I would be called upon at family gatherings to “Give us a turn babe” and the music would be put on and off I’d go. Of course, I hadn’t a clue what I was doing, I just kept up with the music. 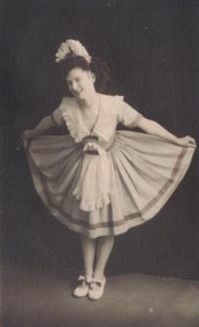 My parents had a gramophone and the latest hit records of their day, they were both good dancers. 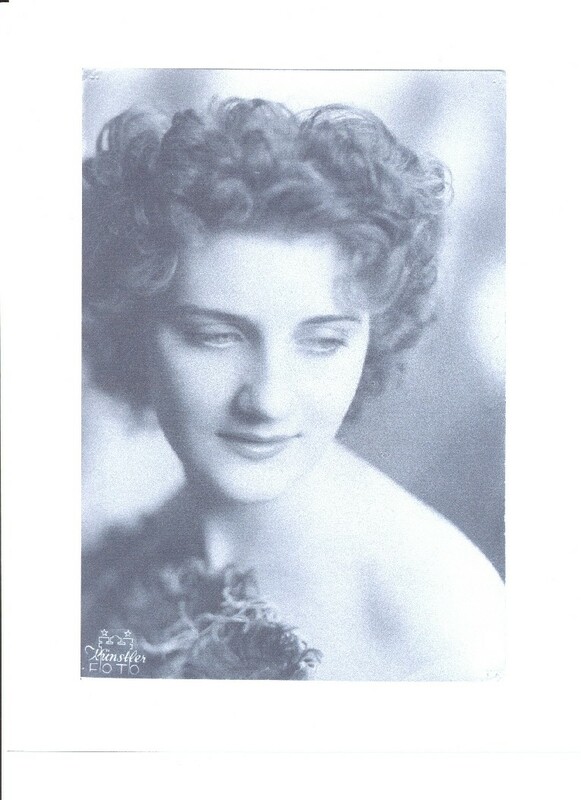 I am talking here of the early 1930’s. Then of course, kids of my age were enthralled by the Shirley Temple films. I got into trouble one day dancing outside the pub, which was my Dad’s local. I could make a good noise on the tiled surface of the entrance as I had my shoes mended with ‘Blakeys’ to stop them wearing out. Also the music of the piano was too good to miss. However, when the patrons of the pub started to give me pennies my Father came out to see what the fuss was about and that was the end of that. Not long after the pub episode I begged my mother to let me go to a tap dancing class which were held in a local scout hall. It cost sixpence for an hour and after my first lesson I wanted tap shoes as the other pupils had them. I was told I would have to wait. My Mother thought I would get fed up with lessons and give up. After a few weeks I got my shoes, bright red ones. It’s a wonder I didn’t ruin them as I wore them in the street to and from the class. I learned my first time step and shuffles and thought I knew it all. In 1938 war clouds were forming and our class ended, I was ten. At 14 I left school and wanted to go on the stage, I had the idea that after my few dance lessons I was a dancer. I had seen dancers on the halls in variety shows and thought I can do that, so I answered some ads in The Stage and went to auditions where I learned what I was up against. But you can’t keep a keen kid down, so I worked in a grocers shop 8-30 am to 6 pm then went to dance classes two nights a week and later when I could afford it, Thursday afternoons as well. 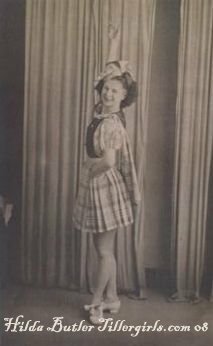 I landed my first professional job six months later as it was panto time and girls were in short supply in 1942 which was lucky for me. It was a tatty show and our digs were awful, there were six of us but to me, I had made it. The next two years were a great education, a series of shows good and bad, periods of no work which was described as “resting”. I did three days with a film unit making a commercial for a well known dry cleaners. 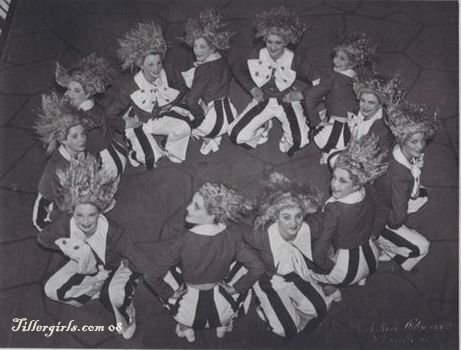 There were six girls dancing in the back ground we got two pounds, two shillings a day, which was good pay. Doreen Austin was the agent for that. 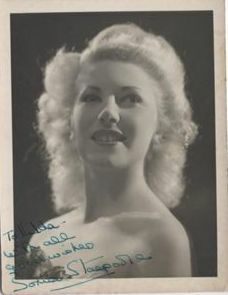 At 16 I auditioned for The Tillers, it was panto time again! 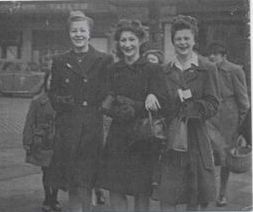 I went to the audition in 1945 after seeing an advertisement in The Stage for girls required for pantomime. I rang the school and was asked to audition the following day. The audition took place in an office. Miss Barbara, Miss Doris and Mr Smith were there, I was asked to do some taps and kicks, no music, it was just show us what you can do, they discussed my abilities as if I wasn’t there! Mr Smith “she is too petite”, Miss Barbara “her taps are good”, Miss Doris “not tall enough”. Well rehearsals start next Monday, she will have to work on the kicks and straighten that leg. Silence for what seemed ages, then “Can you start Monday?” So I was taken on. From here on it was discipline and intensive training, we were well drilled. Their trade mark was precision tap dancing and high kicking routines and we all agreed it was hard work. daily classes at our own expense then rehearsals at half pay, but we loved it. 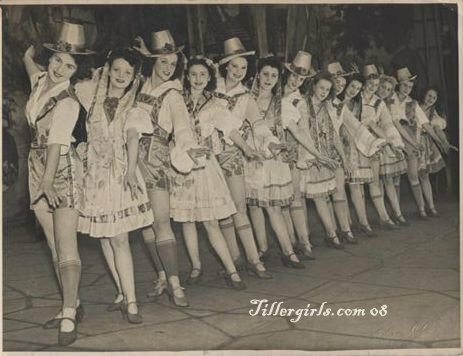 Rehearsal 1945, The Tiller Girls were always in the same position in the line with the tallest girls on the ends, shortest in the middle. I had worked with other troupes and done various things in the business since I was 14 but had never done a kicking routine which once I started the Tiller training, was hard going. At five foot three I was the shortest girl in the line and had to get my legs up with the others. However, I enjoyed the tap routines and had no trouble with that. The salary at four pounds ten shillings a week, half pay for rehearsals didn’t go far after paying for our digs. 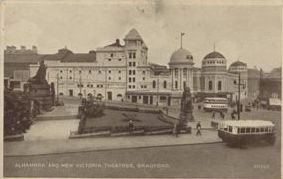 We went to the Alhambra Theatre, Bradford for the 1945-46 season. 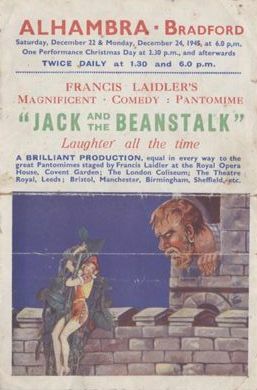 It was a Francis Laidler panto, Jack and the Beanstalk. 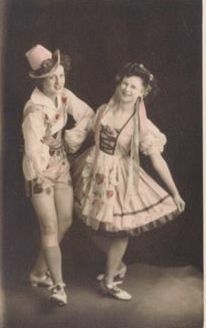 The costumes had been worn before so there was a lot of trying on until something fitted reasonably well, but the shoes were another thing, having to dance in shoes shaped by somebody else was no joke, our white tap shoes for the specialty numbers were much better thank goodness. I went into the flying ballet to replace a girl who didn’t want to do it, she wasn’t a Tiller, I got the job because I was not too tall and weighed under eight stone, it was great. I made some good friends during that time and one in particular… Judy. She and I kept in touch for 56 years until 2001 when she became ill.
After we came back to London I went back to Tillers training for a summer season but girls were coming back from ENSA and so I didn’t get the job as I didn’t make the required height but I still went to classes once a week to keep in trim. This proved to be a good move as when other work came up and I said I had been with Tillers I usually got the job. 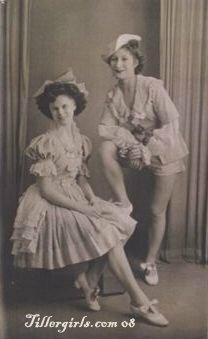 I auditioned for the Windmill Theatre as a dancer and was called back to audition again but when my father found out (I hadn’t told him) he said NO, even though I told him I would be wearing clothes, he didn’t believe me! I was married in 1947 and we came to Australia in 1951. 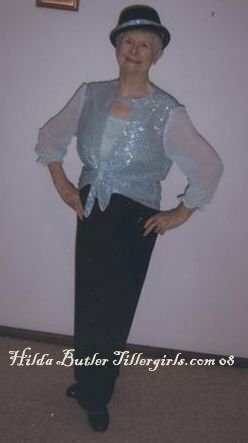 I have danced occasionally over the years, my latest was 2007 at age 79, a bit slower, I must confess but it was fun. 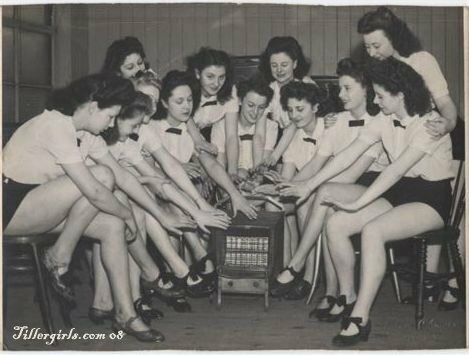 Some of the girls from the 1945-1946 season were, Head Girl Kay, Susan, Myrtle, Yvonne, Bunty, Margie, Heather, Dorothy, Margaret, Judy, Hilda and Sheila. Some of the music for tap numbers, we used to have quick step (ballroom) tempo. Strike Up The Band was popular, Bye Bye Blues was slower, then we had waltz tap to waltz tempo. 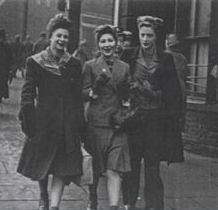 In the 1940’s to 50’s Glenn Millers In the Mood and American Patrol, in fact anything you can do a time step to. 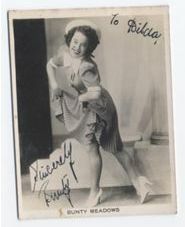 Music was usually taken from the old movies such as the early Judy Garland films and before that 1930’s Fred Astaire and Ginger Rogers, most of those old movie musicals had tap routines.